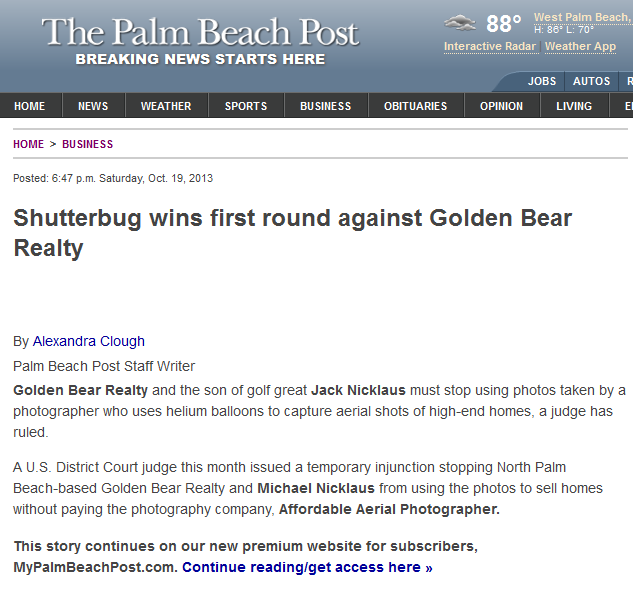 The Palm Beach Post reports a news update on a copyright infringement lawsuit that Schneider Rothman IP Law Group filed on behalf of a real estate photographer. The Post says that a federal judge granted a motion for a preliminary injunction on behalf of Affordable Aerial Photography Inc. against defendants Michael Nicklaus and Golden Bear Realty LLC. The order said that AAP was likely to succeed on the merits of its infringement claims. In the news article posted online on Oct. 19, 2013, law firm partner Joel Rothman explained that the injunction was sought because Golden Bear Realty did not take down the copyrighted photos from its website as promised.